Support for the publication of this essay has been made possible by a grant from the Prince Claus Fund for Culture and Development. Additional support has been provided by Darat al-Funun - The Abdul Hameed Shoman Foundation. This essay deals with a number of issues that Professor Joseph Rykwert (1) raised in an informal presentation to Diwan al-Mimar and the discussion period that followed it. The presentation concentrated on the subject of the building process as a political activity, an issue that has been of concern to Rykwert for some time as he had been working on a book on the nature of the modern city and its future evolution. (2) By political activity Rykwert refers to the presentation of building as a factor in the social fabric, rather than the literal and narrow meaning of the term. He is concerned with the presentation of a building as an object that interacts with its society. Rykwert believes that it is dangerous to consider the act of building merely as a technological process. Currently this process still depends on energy-guzzling devices, which are still being elaborated rapidly, and involve significant transformations in the nature of human labor and the financial structures of society. In examining such a reduction of building to a technological process, Rykwert goes back to about forty years ago when the group of young architects in England, who called themselves Archigram, (3) launched a manifesto in which they proposed a totally apolitical kind of building that depended - only incidentally - on very high-energy consumption. Their designs showed no attempt to respond in any way to the existing social fabric, nor did it suggest any modification of it. It gave priority to individual rather than social requirements. There were a number of other projects that were linked to Archigram, and were concerned with creating such forms of building as would aim to satisfy the physical needs of the individual. Such an idea was launched and even partly realized in Japan, especially in the works of the Metabolist Group, (4) which concentrated on multiple mass-produced, dispensable, and self-contained dwellings in which one could literally 'slot' oneself, and which supplied all of one's physical pleasures as well as needs, at least for a brief time. Rykwert thinks the idea that the individual could in some way be totally enclosed in a self-contained element was launched as a kind of desideratum, but adds that no one would really like to live in a 'pod', as such units came to be called. People still need to congregate - not just in cafes and bookshops, but in offices and institutions - and they still like walking in streets and watching others pass by. There is a whole range of activities that have nothing to do with our immediate physical needs and that need to take place within an urban fabric. It is such activities that the structures proposed by Archigram excluded. Another kind of project might be related to the Archigram period, Rykwert suggests: typical of them is 'the Potteries Thinkbelt' proposed by another British architect, Cedric Price. (5) It was for a university located in a disused shunting-yard in northeastern Britain. It was a time of university expansion and of building shortage; in the 'Thinkbelt' teaching could be done in mobile carriages that could be shunted according to the needs of the curriculum and to interdisciplinary associations. Anyone who has had to do with curricula and timetable knows that such a proposal has little relation to university realities. But the project was very much in the spirit of the time and it received a great deal of attention. The idea and the technological devices it incorporated were very much in harmony with the proposals of Archigram. In 1971, not long after the first publications of the Archigram group appeared, a competition took place for a new culture center in Paris, and the winning entry was by Richard Rogers and Renzo Piano (figure 1). Their project, which was renamed the Pompidou Center (1972-1976), became the first - and remains the best-known realization of the Archigram manner. The movement - or style - (6) now called High-Tech is still with us today. 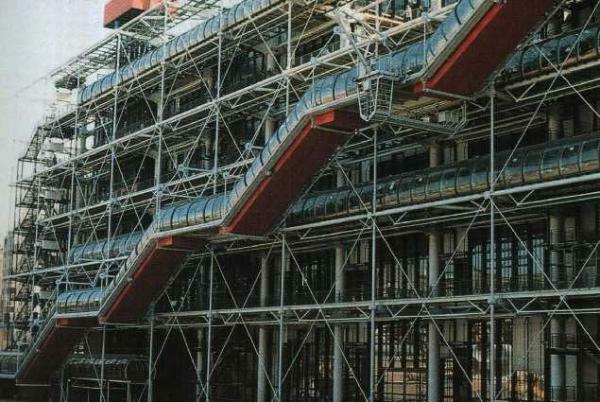 Figure 1: Renzo Piano and Richard Rogers, Pompidou Center, Paris. Rykwert suggests that the early drawings of the Pompidou Center project depended on the ethos as well as the graphic language of the Archigram group. It had a great impact and he suggests further that although the members of Archigram did not produce a great deal of built stock themselves, their influence has been extremely important - in that without them High-Tech architecture would not have developed as it has. Today we are at the high-point of the High-Tech movement or style, examples of which have proliferated throughout the world. The aim of the architects creating High-Tech architecture is to produce a kind of building whose social and formal effects depend very much on conspicuous - though not necessarily novel - technical devices. Architects who build in the High-Tech mode use combinations of materials such as plastic and metal, and suspension building systems and structural devices, all of which had been developed during the past thirty years. There seems to be a connection between the architects of the High-Tech mode and the advocates of the 'decorated shed' as a model for buildings, Rykwert claims. Robert Venturi, Denise Scott Brown, and Steven Izenour elaborated this idea in their book Learning from Las Vegas. (Cambridge, Mass: The MIT Press, 1972) In this book, they state that there are basically two kinds of building. The first is that in which the interior program and the symbolic expectation of the building shape the final outcome, so that the building is actually molded by what goes on within it. That is a kind of building that Venturi and his colleagues considered 'old-fashioned'. Venturi, Brown, and Izenour proposed a new model: the decorated shed. This is an industrially produced structure whose internal planning is completely elastic and has no relation to the outer skin of the building, which might be any kind of ornamental facade - stylistic or non-stylistic, historicist or non-historicist. Such addition could be mere advertising or could refer to some local notions or even to the purpose of the building. Rykwert believes that the decorated shed, as proposed by Venturi and his colleagues, is indeed the kind of building that High-Tech architects produce, and that there is no inherent reason why the decorated shed should not, for example, be sheathed in reflective glass. Rykwert added that we are now seeing the evolution of a new kind of building, a kind that he thinks will dissolve even the High-Tech building. This is because we have computers that will allow us to perform not only a series of operations that will substitute for the drawing board, but that will allow us to perform operations on the social fabric. Rykwert mentions that the possibilities presented by computers are often presented as wholly desirable and beneficial developments. However, he adds that the possession of such a new technology will probably lead to an atrophy of certain capabilities. A common example of this is the arrival of the pocket calculator and the negative effects it has had on the simple arithmetic skills of its users. We are definitely going to see a great expansion of computer applications in industry, and certainly in building. For a long time, we have been promised that computerized robots would come to replace human operatives in performing the repetitive actions that make industrial labor so offensive to so many people in the process of mass production. This, however, has not happened yet, and industrial labor remains a very intensive and time-consuming endeavor. However, what Rykwert believes has become mechanized in a way we had not quite expected is agricultural labor. He adds that this development has led to an extremely violent transformation of many social fabrics, and mentions how as a result of globalized mechanized farming, it is often considerably cheaper to buy industrially produced agricultural products from faraway countries than to grow them locally. This issue has recently become the concern of governments in a number of countries. The idea that the service sector, instead of the industrial one, has come to represent the primary economic activity in the developed world is beginning to greatly influence the way in which we relate to the city, according to Rykwert. We are consoled by the notion emphasized by the prophets of technological progress that technological advances will allow wealth, which is still concentrated in the hands of the few, to trickle down to the poor. The 'trickle-down' effect of wealth is something that is much talked about, but it seems that wealth is becoming increasingly concentrated in most modern societies. This concentration of wealth is something that we represent in our buildings. A city with a fairly low-rise profile, but which has a number of high-rises pushing up at odd places, is reflecting the concentrations of wealth and power in it. Trying to change such physical patterns through legislation and building regulations would therefore be an attempt to negate certain socio-economic realities. Rykwert concludes that by the combination of high-tech aspiration and 'decorated shed' renunciation architects have denied themselves the possibility of approaching buildings as social and political elements. He hopes that the coming generation of architects will regain a way of talking about architecture that has a formal coherence, and that allows for a new relationship to emerge between what is being built and the social fabric. One of the questions raised following the presentation concerned the difference between the two terms 'style' and 'movement', since Rykwert used both terms when discussing High-Tech architecture. His answer was that the term "style" is a classification applied to past events and achievements - to the events or the works of art of a certain period. It is not generally how someone decides to build or paint - at least this is the way it was until the mid-nineteenth century, when a whole repertory of past 'styles' came to be employed interchangeably. On the other hand, the term "movement" can be used when a group of people intends to do certain things for stated reasons - and it may be a self-conscious desire to work in the manner of a time past. In general, a movement implies a formulated manifesto, or at least some sort of statement of aim, usually with the idea that the approach will replace older ways of doing certain things. A movement is a coherent group with an ideology, whereas a style does not necessarily have an ideology, although it is quite often related to an ideology. Rykwert added that the reason why he hesitated to choose between 'style' and 'movement' when talking about High-Tech architecture is that 'style' has become a sort of a 'bad word' since the 1930's, and a whole set of other terms have emerged to get round the unfortunate associations. However, it seems to him that High-Tech is more of a style than a movement. Another questioner inquired as to how architects can take on a socially active role in society and counteract the phenomenon of envisioning building as being a process that was only technologically motivated and therefore devoid of social content. In replying to this question, Rykwert mentioned that some of his colleagues, of a Marxist persuasion, produced an argument that became quite popular. They maintained that in the post-capitalist world, which is a society without politics, no meaning can be attributed to buildings. However, Rykwert thinks that such an argument is insidious. He believes that whenever one looks at a building one is inescapably drawn to interpret it and therefore to attribute some form of meaning to it. Rykwert added that although theorists of architecture of the 16th and 17th centuries, for example, insist that buildings should be suited to their purpose and solidly built, yet they also tell us that the most important task of the architect is to make them harmonious and to make them 'speak' for the clients. However, architects today seem ashamed of such a task, a shame that Rykwert believes they must get rid of. Such questions are often reduced to a concern with 'aesthetics'. But aesthetics may be what people do when they talk about buildings, but it is certainly not what architects do when they design them. This is why Rykwert thinks architects must understand the way in which buildings are received, something about which they seem to know about or care for very little. It is difficult to find any research projects concerned with this issue. An exception was Kevin Lynch, the American theoretician, academician, and practitioner of city planning, who developed at the Massachusetts Institute of Technology (MIT) very important - though unsystematic - models showing how people read the city. (7) Unfortunately, he has not had emulators. In fact, the whole notion of how buildings and people relate to each other and how people see and interpret buildings is hardly ever considered in the designs of architects. In this context, Rykwert gave the example of what had occurred during the design process for the as yet unbuilt World Financial Center in Shanghai. This 90-story building has a square plan, which begins to taper about a third up its height to a thin diagonal at the summit. In order to solve the problems of wind resistance, the designers cut a fifty meter circular hole at the top of the building. Bearing in mind that the financiers for the building were Japanese, many people in Shanghai viewed the circular hole as a representation of the Japanese rising sun, and consequently a symbol of Japanese dominance. This interpretation caused considerable anxiety, and the architect was made to design a bridge across that circular void, thus providing for a different and more acceptably 'Chinese-style' interpretation of the building. Another theme that was discussed relates to the connection that Rykwert made in his presentation between Robert Venturi's 'decorated shed' and High-Tech architecture. 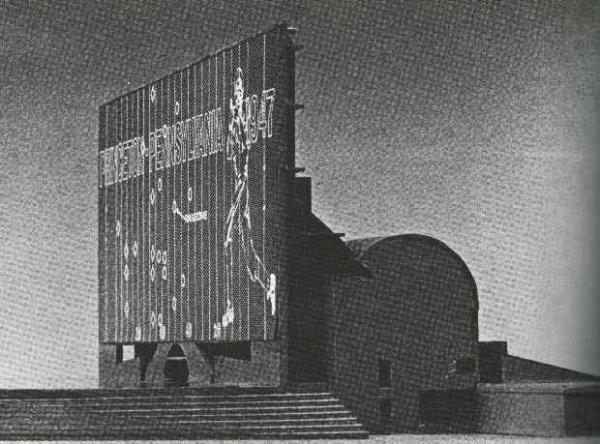 One of the Diwan members commented on how Rogers and Piano in their Pompidou Center used as a model Venturi's idea of the screen or electronic billboard that he designed for the unbuilt 1967 Football Hall of Fame project in New Brunswick, New Jersey (figure 2). Venturi designed a large screen for this project on which information such as football game scores would be displayed, and which both dwarfed and concealed the actual building behind it. Rogers and Piano hoped to incorporate a large screen in their design, but budgetary restrictions prevented them from doing so. Figure 2: Venturi Rauch & Scott Brown, entry for the National Football Hall of Fame Competition, Rutgers University, New Brunswick, New Jersey, 1967. When asked about this, Rykwert agreed that Venturi's forecast has turned out to be accurate, but had not been realized in the way he wanted. He believes that one problem with prophecies is that they often tend to be realized, but not as originally intended. For example, the ideas of Archigram have been realized, but not in the way the creators of the movement had intended. He added that Venturi's prophecy does not appear only in Amman, but everywhere. He cited the example of Times Square in New York City, in which one is not allowed to display signs below a certain voltage, because all the signs should be equally bright (figure 3). However, it can be said that in Times Square Venturi's prophecy is being fulfilled in a sort of ironic manner, (8) whereas in Amman it is happening unconsciously and without any sense of irony. A question was raised about the idea of society as a spectacle and how this might have an impact on High-Tech architecture. Rykwert mentioned that the idea of a society of spectacle has been around for some years, and that the influence of such an idea is, in a way, marginal to High-Tech architecture. Society has always had an element of spectacle in it. However, the situation that Rykwert believes can justify the strident tone of some contemporary critics is the insistent and usually commercial substitution of surrogate for authentic, for real experience - however that may be defined. He thinks it is distressing that we are dependent - even in our daily behavior - on forms of invasive spectacle such as televisions, movies, and nowadays on-screen displays that are being increasingly carried on buildings. Within a few years, thin display screens will increasingly replace the cathode ray tube, and computer images will become very large and it will be possible to hang them on buildings like a picture. Those screens will become part of the spectacle we are discussing and then perhaps the decorated shed will really become the dominant form of building. Rykwert suggested that we are being overfed with images anyway. He wonders whether there will be a point at which we will be faced with such an excess of images that we will have to withdraw from them in some ways, or whether we will find ways of digesting this constant assault. Rykwert believes that architects surrendered their right to providing images in the urban context a long time ago when they allowed advertising to invade the building, and this happened long before Robert Venturi theorized about the subject. Rykwert added that we have become used to buildings in the center of the city not maintaining their autonomy, but being covered with many kinds of commercial devices. This fact makes us very often forget the buildings themselves. 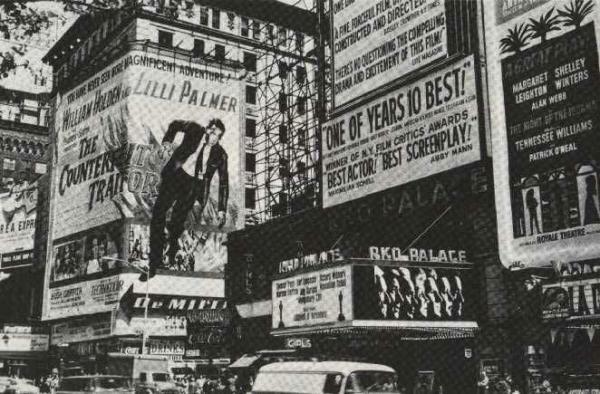 For example, people no longer know what the buildings of Times Square, which are now covered with huge electronic posters, used to look like. Influenced by spectacles, people have forgotten that Times Square was called that because it is where the building of the New York Times was located. Thus, Rykwert believes that what we need to think about is not so much the nature of the spectacle, but the nature of the buildings, which are the permanent objects we produce. One issue that was raised dealt with High-Tech architecture and the manner in which it reacts to issues concerning environmental sustainability, as is the case with green architecture and energy-saving architecture. Rykwert responded by stating that his presentation had not intended to deal with this aspect of sustainability, although it is an admirable goal to try to achieve. Still, one should not confuse the subject of environmental sustainability with the other problems of the city. In this context, Rykwert gave the example of the Commerzbank Tower in Frankfurt (1997), Germany. This is a High-Tech building that has been inserted into the urban fabric of the city as the tallest building in Europe. It was allowed to go above the permitted heights set by existing building regulations through an exchange base of environmental benefits. The building also attempts at its base to slot into the urban fabric, which many high-rise buildings do not do. The important thing is that the trade-off for allowing the high-rise to be built was environmental sustainability. However, no matter how 'green' the high-rise might be, it still is an intrusion in the urban fabric, and although it might solve energy problems, it does not solve urban problems. Another questioner inquired whether the phenomenon of architects abandoning their social role can be linked to the post World War II era, when some architects stated that the idea of utopia no longer made any sense. This idea of utopia is based on creating a new ideal physical setting for communal living that is set off from the chaotic and unmanageable city. Rykwert agreed to this, mentioning that the idea of utopia was given a very bad name in the post-war period. He added, however, that this did not take place in the construction period that immediately followed the war when the CIAM (Congres Internationaux d'Architecture Moderne) architects still displayed some positive emotions towards the idea of utopia. Rykwert thinks that what really gave utopia a bad name were those buildings of new post-war cities which were built too much too quickly. Hence, people got the impression that architects and the authorities had been stripped of ideas, an impression that was supported by the wrecking of historic city centers throughout the world during the 1950's and 1960's. Although such a perception does not seem to Rykwert to be entirely accurate, he believes it has a certain amount of truth in it. Therefore, by the 1950's, many architects had already developed second thoughts about the way the idea of utopia related to the built fabric, and since then the idea has been given a very bad name, a situation that remains with us till today. Rykwert believes that it is the architect's duty to rescue the idea of utopia. He wonders what would be the point of practicing architecture if the architect does not try to make the world a bit better than it was before he or she started. After all, the job of the architect requires great effort and consumes tremendous amounts of time, but in most cases does not offer much in terms of financial rewards. A question was raised about the categorization of architecture into 'rational' and 'romantic', and whether it is possible to assign the word 'style' to the romantic phases of the history of architecture, and the word 'movement' to the rational phases. Here, Rykwert responded that such an attitude of using binary opposites was quite common in the architectural discourse of the 1960's and 1970's. However, he expressed a disinclination towards relying on the idea of binary opposites since, for example, one can always find evidence that would lead to a fluctuation in choosing whether a building is a romantic or a rational one. Therefore, he thinks such opposites should not be treated as absolute and stable categories. He believes that one should concentrate on considering the data that any study offers and seeing where they lead without imposing a preconceived schema on the material being studied. In connection to Rykwert's reaction towards the idea of 'binary opposites', a comment was raised that the use of dialectics has been a useful way of looking at the evolution of architecture. In fact, the history of twentieth-century architecture can be viewed as a dialectical process involving a reliance on technology on the one hand and on history on the other for defining the nature of architectural production. It was added that the dissatisfaction that Rykwert expressed towards a reliance on binary opposites implies a dissatisfaction with a reliance on viewing history as a dialectical process. Rykwert was therefore asked what other methodological framework he could suggest for studying the past. In answering this question, Rykwert stated that his viewpoint towards the use of binary opposites does not apply to viewing history as a dialectical process. He mentions that he is dissatisfied with binary pitting opposites at each other as a kind of mechanism. However, this is not the case with the dialectic approach, which is dynamic in its nature. Any dialectic proposes a resolution of opposites into a synthesis, which in turn becomes a thesis, for which there is another antithesis, and so on. He added that this dialectical process is one on which he of course relies in his study of architecture. Towards the end of the discussion period, a question was raised about Rykwert's viewpoint of High-Tech architecture when looking at its evolution from the Pompidou Center to Frank Gehry's Guggenheim Museum in Bilbao (1997), and what he would expect to take place in the foreseen future. Rykwert responded that because the Guggenheim Museum has been very successful, many economically struggling cities have started to think of boosting their economy through creating similar museums. However, he believes that the creation of the Guggenheim Museum is not a repeatable process, for this project is a one of a kind. However, Rykwert adds that he might be proven wrong, in the sense that Jorn Utzon's Sydney Opera House (1955-1973) represented a similar phenomenon, and the enormous growth of Sydney as a cultural center is strongly linked to the creation of this building. He added that although the Sydney Opera House and the Bilbao Guggenheim Museum are separated by a significant time span, this phenomenon of a major new cultural building revitalizing a city at the cultural and economic level might happen more frequently. In this context, he mentioned Daniel Libeskind's recently designed Imperial War Museum in Manchester, which, he believes, might have a positive effect on that part of the city. However, he prefers not to prophesy, but to wait and see how such ideas will develop in the future. In this context, one of the Diwan members commented that an example of other museums that have had a positive effect on the urban centers in which they are located is James Stirling's Staatgalerie in Stuttgart (1980 - 1983). (1) Joseph Rykwert (b. 1926) is Professor Emeritus of architecture at the University of Pennsylvania, where he served as the Paul Philippe Cret Professor of Architecture and the Chairman of the Ph.D. Program in Architecture. Before moving to the United States in 1988, he taught at Cambridge University and the University of Essex, where he set up the world's first program in History and Theory of Architecture. He has lectured or taught at most major schools of architecture worldwide. He is the author of a number of books, all translated into several languages. These include On Adam's House in Paradise (Cambridge, Mass. : The MIT Press, 1982, second edition), The Idea of a Town(Cambridge, Mass. : The MIT Press, 1982, second edition), The First Moderns (Cambridge, Mass. : The MIT Press, 1980), and The Dancing Column (Cambridge, Mass. : The MIT Press, 1996). (2) The book has appeared recently under the title of The Seduction of Place: The City in the Twenty-First Century (New York: Pantheon, 2000). (3) Archigram was formed in the early 1960s by six British architects (Warren Chalk, Peter Cook, Dennis Crompton, David Greene, Ron Herron, and Michael Webb), who stated 'we are in pursuit of an idea, a new vernacular, something to stand alongside space capsules, computers and throw-away packages of an atomic-electronic age'. Their message was, as Ada Louise Huxtable put it, 'that architecture is not eternal and timeless, but disposable, mutable, movable and temporary'. Archigram's utopian vision included ideas such as Instant Cities, Plug-In Cities, and Walking Cities. (4) The Metabolist Group, which was formed in 1960, emphasized the creation of minimal capsules produced by advanced mass-technology. It was strongly influenced by Kenzo Tange, and its members included Kisho Kurokawa and Fumihiko Maki. See Vittorio Magnago Lampugnani (ed. ), The Thames and Hudson Encyclopaedia of 20th Century Architecture (London: Thames and Hudson, 1986). (5) Price, who has very few extant buildings to his name, favors non-architectural solutions to the accommodation of human activities, and is critical of the limitations of permanent and monumental buildings. See Charles Jencks and Karl Kropf (eds. ), Theories and Manifestoes of Contemporary Architecture (New York: John Wiley & Sons, 1997). (6) A discussion of the differences between the terms 'movement' and 'style' was raised during the discussion that followed the presentation, and can be found in the Questions and Answers section of this essay. For additional information on High-Tech architecture, seehttp://www.GreatBuildings.com/types/styles/high_tech.html. (7) See Kevin Lynch, The Image of the City (Cambridge, Mass. : The MIT Press, 1964). (8) In his book Complexity and Contradiction in Architecture (New York: Museum of Modern Art, 1966; second edition, 1977), where he declared that 'Main Street is almost all right', Robert Venturi compared Times Square favorably with Piazza San Marco in Venice. He mentioned that although the spatial order of the Piazza San Marco is consistent, it has violent contradictions in scale, rhythm, varying heights, and styles of the buildings surrounding it. Similarly, he viewed Times Square as a place that derives its vitality from the inconsistencies of buildings and billboards, which are contained within the consistent order of the space itself. Figure 1: Renzo Piano and Richard Rogers, Pompidou Center, Paris, 1972 to 1976 (Andreas Papadakis et al., Architectural Design for Today(Paris: Pierre Terrail, 1992)). Figure 2: Venturi Rauch & Scott Brown, entry for the National Football Hall of Fame Competition, Rutgers University, New Brunswick, New Jersey, 1967 (Stanislaus von Moos, Venturi, Rauch, and Scott Brown Buildings and Projects (New York: Rizzoli, 1987)). Figure 3: Times Square, New York (Peter Blake, God's Own Junkyard(New York: Holt, Rinehart and Winston, 1979)).